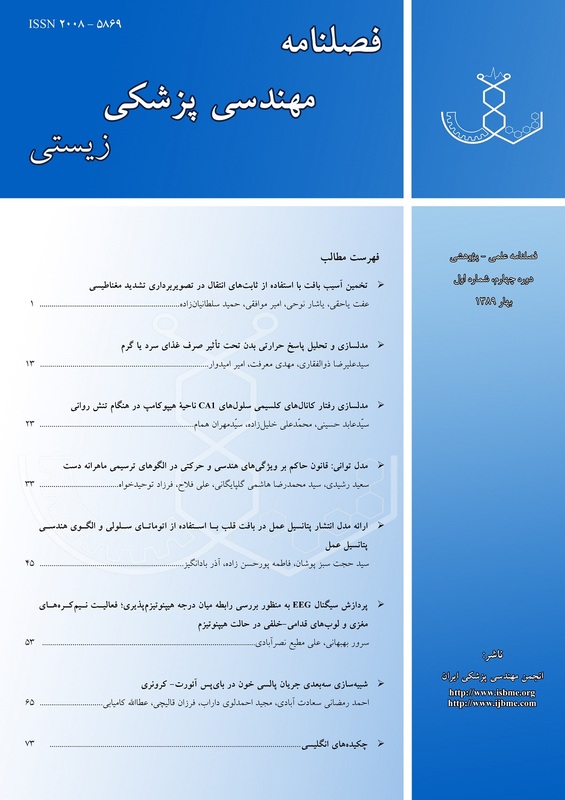 در حرکات ترسیمی، خواص هندسی مسیر و ویژگی های حرکتی تحت قیودی خاص قرار دارند که با دو قانون توان دو- سوم و اصل شیب یکسان شناخته می شوند. در این مقاله با طراحی آزمون هایی درباره افراد 16-18 سال، به بررسی نوع ارتباط این دو قانون تجربی در حرکات مستقیم و منحنی شکل پرداخته می شود. با ارائه دو مدل توانی نشان داده می شود در الگوهای ترسیمی ویژگی های تغییرناپذیر قابل تعریف بوده که مستقل از فرد، جهت، چرخش و طول الگو است و در تعامل با یکدیگر علاوه بر ساده سازی نقش سیستم فوقانی کنترل حرکت، باعث کاهش تعداد درجات آزادی و پیچیدگی محاسبات می شوند. In drawing movements, the constraints imposed on the trajectory geometry properties and kinematics are known with two laws: 2/3 power law and isochrony phenomenon. In this paper experiments have been designed to study the relation between two empirical laws in straight and curved patterns of drawing movements in 16-18 years old subjects. Providing two models of power is indicated that in drawing movements, invariant features can be defining. These features are independent of subject, direction and size of trajectory and together they can simplify the role of the upper motor control system and decrease the degrees of freedom and the computational complexity. Woodworth R.S., The accuracy of voluntary movement; Psychological Review, 1899; 3: 1-106. Schmidt R.A., Motor control and learning: a behavioral emphasis; 2nd Edition; Human Kinetics; 1988. Hogan N., An organizing principle for a class of voluntary movements; J. of Neuroscience, 1984; 4: 2745-2754. Wann J., Nimmo-Smith J., Wing A.M., Relation between velocity and curvature in movement: Equivalence and divergence between a power law and a minimum-jerk model; J. of Experimental Psychology: Human Perception and Performance, 1988; 14: 622-637. Richardson M.J. Flash T., Comparing smooth arm movements with the two-thirds power law and the related segmented control hypothesis, J. of Neuroscience, 2002; 22 (18): 8201-8211. Nelson W.L., Physical principles for economies of skilled movements; Biological Cybernetics, 1983; 46: 135-147. Flash T., Hogan N., The coordination of arm movements: An experimentally confirmed mathematical model. J. of Neuroscience, 1985; 5: 1688-1703. Uno Y., Kawato M., Suzuki R., Formation and control of optimal trajectory in human multijoint arm movement; Biological Cybernetics; 1989; 61: 89-101. Harris C.M., Wolpert D.M., Signal-dependent noise determines motor planning; Nature; 1998; 394: 780- 784. Lebedev S., Tsui WH., Van Gelder P., Drawing movements as an outcome of the principle of least action; J. Mathematical Psychology, 2001; 45: 43-52. Soechting J.F. Terzuolo C., An algorithm for the generation of curvilinear wrist motion in an arbitrary plane in three dimensional space; Neuroscience, 1986; 19: 1393-1405. Lacquaniti F., Terzuolo C.A., Viviani P., The law relating kinematics and figural aspects of drawing movements; Acta Psychologica, 1983; 54: 115-130. Georgopoulos A.P., Kalaska J.F., Massey J.T., Spacial trajectories and reaction times of aimed movements: effects of practice, uncertainty, and change in target location; J. Neurophysiology, 1981; 46: 725-743. Soechting J.F., Lacquaniti F., Invariant characteristics of a pointing movement in man; J. Neuroscience, 1981; 1: 710-720. Morasso P., Spacial control of arm movements; Exp. Brain Research, 1981; 42: 223-227. Viviani P., Terzuolo C., Trajectory determines movement dynamics; Neuroscience, 1982; 7: 431-437. Viviani P., Stucchi N., Biological movements look constant: evidence of motor perceptual interactions; J. Exp. Psychology, 1992; 18: 603-623. Viviani P., Mounoud P., Perceptuo-motor compatibility in pursuit tracking of two-dimensional movements; J. of Motor Behavior, 1990; 22: 407-443. Gribble P.L., Ostry D.J., Origins of the power law relation between movement velocity and curvature: modeling the effects of muscle mechanics and limb dynamics; J. Neurophysiology, 1996; 76: 2853-2860. Schaal S., Sternad D., Origins and violations of the 2/3 power law in rhythmic three-dimensional arm movements; Exp. Brain Research, 2001; 136: 60-72. Dounskaia N., Kinematic invariant during cyclical arm movements; Biological Cybernetics, 2007; 96: 147- 163. Viviani P., Flash T. Minimum-jerk model, two-thirds power law and isochrony: converging approaches to the study of movement planning; J. Exp. Psychology, 1995; 21: 32-53. Richardson M.J.E., Flash T., Comparing smooth arm movements with Two-Thirds power law and the related segmented control hypothesis; J. Neuroscience, 2002; 22: 8201-8211. Teuling H.L., Maarse F.J., Digital recording and processing of handwriting movements; Human Movement Science, 1984; 3: 193-217. رشیدی سعید، هاشمی گلپایگانی محمدرضا، فلاح علی، توحیدخواه فرزاد؛ رابطه میان خواص هندسی و ویژگی های حرکتی الگوهای ترسیمی مهارتی؛ دوازدهمین کنفرانس مهندسی پزشکی ایران، 1384، 379-386. Schmidt R.A., Motor learning and Performance; Champaign Illinoise: Human Kinetics Books; 1991. Plamondon R., Alimi A.M., Yergeau P., Leclerc F., Modeling velocity profiles of rapid movements: a comparative study; Bilogical Cybernetics, 1993; 69: 119-128. Milner J.T., Controlling velocity in rapid movements; J. Motor Behavior, 1986; 18: 147-161. Nagasaki H., Asymmetric velocity profiles and acceleration profiles of human arm movements; Exp. Brain Research, 1989; 74: 319-326. Plamondon R., A kinematic theory of rapid human movements: 2. Movement time and control; Biological Cybernetics, 1995; 72: 309-320. Gielen C.C.A.M., Oosten K., Pull ter Gunne F., Relation between EMG activation patterns and kinematic properties of aimed arm movements; J. Motor ehavior, 1985; 17: 421-442. Plamondon R., Alimi A.M., Speed/accuracy trade-offs in target-directed movements; Behavioral and Brain Sciences, 1997; 20: 279-349. Plamondon R., Guerfali W., The 2/3 power law: when and why? Acta Psychologica, 1998; 100: 85-96.